﻿ Automation Creations, Inc. Design and CMS for Alexander Arms Industries, Inc.
Alexander Industries, Inc. contacted ACI to discuss migrating their current website, which utilized a proprietary content management solution, into a new system. The goals included utilizing the current design and integrating the layout and navigation within a new content management solution. All existing website files needed to be migrated to the new content management system (CMS). Google Analytics was to be set up to track site traffic. And a system to support managing customer mailing lists needed to be built. Alexander Arms was also seeking recommendations for a new e-Commerce package that supported USPS integration for calculating shipping costs, client email confirmation of orders, shipment tracking integration, and the ability to post multiple photos per product. 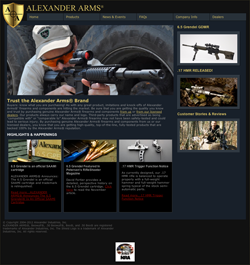 ACI migrated the existing Alexander Arms website template and content into a new CMS and e-Commerce package. The website utilized Joomla, and the new e-Commerce package was Fortune 3’s Storebuilder. ACI utilized some Joomla components to offer additional interactivity for customers including a calendar of upcoming events, site search, and a news area. Additionally, ACI configured a dealer login area where dealers can register by completing an online form. Once a dealer logs in, they are able to view additional content.